We recently moved Tyler Lee into his toddler room and I've been busy adding little touches to the room to make it somewhere peaceful, fun and a little bit whimsical place for him to sleep and play in. We love bunnies, in fact Tyler Lee sleeps with a little bunny soft toy everynight so when I stumbled across this beautiful white rabbit lamp from White Rabbit England I knew it would be a perfect addition to his room. Not only is this lamp quite adorable but it's made from the finest quality bone china too and has a lovely glossy finish. The little rabbit is super cute holding it's paws up and with one ear up and one down, it's a lovely piece to both look at on display and for functionality in a room too. The lamp comes with a little screw in fixture with bulb attached and is super easy to fit together, the lamp switch is attached to the lead of the lamp too so it doesn't spoil the look of the rabbit and is very quietly turned off too if needed. The light shines through the bone china giving a beautiful soft glow effect which is very calming. I love when this light is on, it gives a very peaceful air to the room, one which no doubt is very reassuring for little ones if they wake up during the night. This light is handmade which is something that I love in any product. Handmade products tend to be better quality, have more care and love gone into making them and these are qualities which I can definitely seen in the White Rabbit England white rabbit lamp. This lamp is such a lovely addition to Tyler Lee's room, I only wish it had been part of his nursery too. It's a beautiful piece and one which proudly sits on display on top of his chest of drawers before being turned on each night to give a calming effect to the room with it's warm glow as he drifts off to sleep. The White Rabbit England white rabbit lamp is £75. You can read more about the white rabbit lamp and browse the other beautiful products which White Rabbit England have to offer on the White Rabbit England website, you can also follow them on Twitter and Facebook for regular updates. White Rabbit England have offered one lucky blog reader the chance to win one of their beautiful nursery bed sets woth £39. 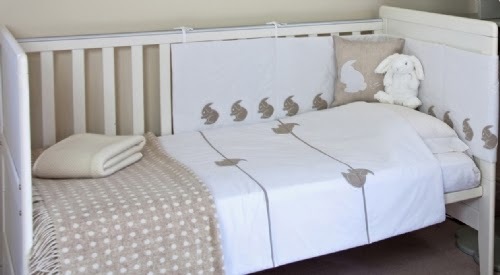 These sets are three piece and include a bumper, quilt and matching cushion all embroidered with a rabbit design. 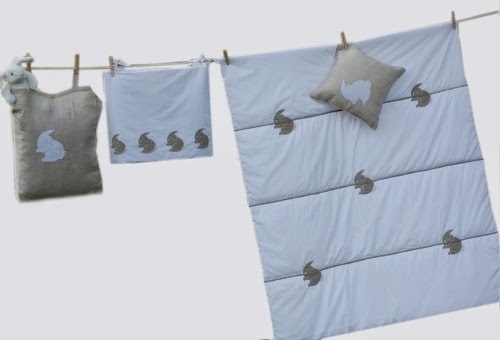 This nursery bed set also comes in a reusable linen bag with a stitched rabbit design. 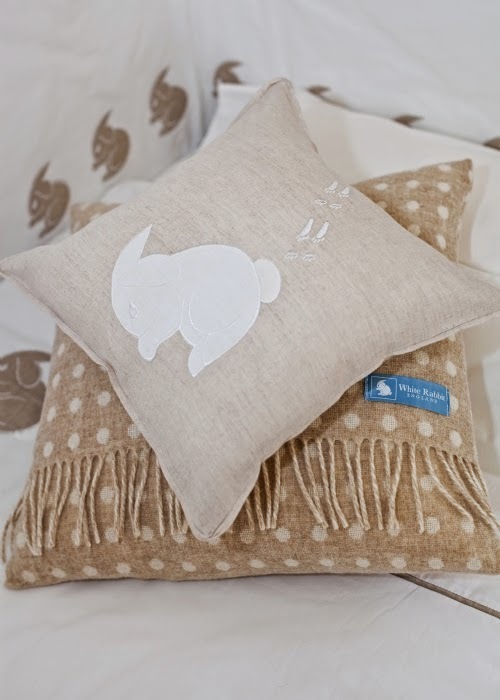 This set is really beautiful and comes in neutral white and beige making it perfect for any nursery. This giveaway is open worldwide. Enter via the Rafflecopter below and best of luck to anyone who enters. Son of my sister! :) love it. thanks! That's great but please note this giveaway is for the bedding set and not the lamp. You're welcome but please note this giveaway is for the bedding set and not the lamp. I love that lamp! Can I ask, about the giveaway, pretty please consider having less compulsory entries? I had a lamp like this when i was little, my mom told me that keep the monsters away. It will also be a great attraction for my cute nieces when they will come for a visit. That lamp is either super cute or super creepy, I'm not sure which! But the bedding! Oh man. If they did adult size stuff I'd totally enter this giveaway, lol. It's so cute.I think I'll put this adorable lamp in my son's room. Aww, this is lovely! My housemates sister is having a baby in the summer so I'm entering with the intention of giving the prize to her if I win - they've just moved to England from Crete so could use all the help they can get while settling in! This is a stunning looking lamp! The rabbit lamp is so cute! I would add this adorable bedding set to my daughter Violet's bedroom. She loves bunnies. hi, my little son would love this! This would look amazing in my God son's room <3 neutral colours are the best!